The 2013 Rush Tex is sized for the American market which is more full in the chest and shoulders than some European designs. We tried a size Medium jacket on Huey and an XL on Dewey (our Fit Check mannequins) and they fit just fine. You can see some shots of how they look by clicking the “View Larger Images” link above. These jackets have Velcro straps at the waist to help customize the fit. FirstGear publishes a chart which summarizes the max chest and max waist/belly (whichever is bigger) for each size and we’ve included that below. I found this jacket to have a shell size that was very comparable to other FirstGear street jackets, but this one seem to feel bigger on me since it does not have a removable thermal liner as part of the design. For that reason, I’m going to say that the jackets fit about 1/2 size larger than the chart indicates. So if you are at the lower end of a size range or between sizes, I’d advise to choose smaller. 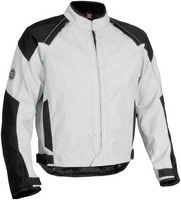 FirstGear offers this jacket in tall sizes. The tall selection of each size adds about 1 1/2 to 2 inches to the torso and sleeve length. If you normally have to buy “talls” then these should work for you.